Apple today announced the iPhone Xs and iPhone Xs Max. These devices are upgrades to last year's iPhone X and feature the same design. The new iPhones have an all-screen look with a notch at the top of the display. The front and back surfaces are made of glass and a stainless steel frame is in between. 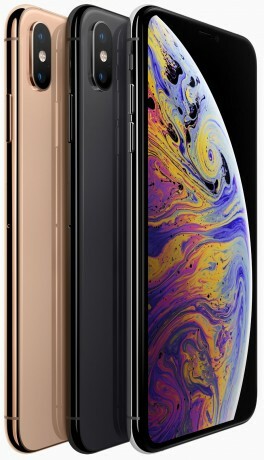 The Xs maintains the same 5.8-inch size as last year's phone, while the Xs Max pushes the screen size to 6.5 inches. Apple says it uses new glass that is the most durable ever on a mobile device. The OLED displays support Dolby Vision and HDR10, with a 60% greater dynamic range. The screens have True Tone for accurate whites, as well as 3D touch and 120Hz touch response. The iPhone Xs and Xs Max will be sold in gold, silver, and space gray. The phones are rated IP68 for protection against water, dust, and other liquids. Apple has improved the stereo speakers, giving them a wider sound stage. The 10x features an improved Face ID with better sensors and faster performance thanks to quicker algorithms. In order to power the new iPhones, Apple designed the A12 bionic, with a 7nm process, 6-core CPU (2 high-performance, 4 efficiency cores), 4-core GPU (50% faster), and an 8-core neural engine with dedicated machine learning. Apple says the device can process far more real-time information for the camera, Animoji, selfie scenes, and more. The A12 Bionic helps Apple bring new tools to the iPhone's camera. The Xs has a two-camera system, each with a 12-megapixel sensor. The main lens features a wide-angle field of view at f/1.8 while the secondary lens features a telephoto view at f/2.2. The cameras have optical image stabilization. The A12 Bionic can perform 1 trillion calculations on the photos to improve them. The selfie camera has a 7-megapixel sensor and uses the IR sensor to deliver depth information for portraits. The new Smart HDR feature relies on the A12's neural engine to enhance color and improve exposure. The improved portrait shooting allows people to adjust the background blur with a new depth-of-field slider in the editing tool. The iPhone can now record stereo sound with video. Apple says the battery should deliver 30 more minutes of uptime when compared to the iPhone X, and the Xs Max delivers 90 more minutes. The new iPhones introduce gigabit LTE, dual SIM card support (with dual SIM, dual standby provided by eSIM), wide support for worldwide LTE bands. Apple says AT&T, T-Mobile, and Verizon will support this dual SIM technology, which includes one physical SIM and one eSIM, this year. The iPhone Xs will start at $999 and the Xs Max will start at $1099. Both will be available in 64 GB, 256 GB, and 512 GB options. Preorders for the new iPhones start September 14, with in-store availability on September 21.